But recently, I came across a study about broccoli and gut health that inspired me to give broccoli another chance. You are probably aware that probiotics, found in foods like yogurt, cheese, sauerkraut, kimchi and kombucha, are key in helping keep your gut healthy. A healthy gut is extremely important for our overall health, energy levels, fighting off diseases, properly absorbing healthy nutrients and eliminating toxins. And now in a recent study involving mice, scientists found that eating broccoli may help with gastrointestinal health. When the mice were fed broccoli with their normal diet, “they were better able to tolerate digestive issues similar to symptoms of leaky gut and colitis than mice that were not placed on a broccoli-supplemented diet,” according to study notes. Researchers said broccoli and other cruciferous veggies, including Brussels sprouts, cabbage and cauliflower, contain an organic chemical compound that breaks down into other compounds, like indolocarbazole (ICZ). Scientists of the study believe that in order for humans to get this beneficial effect from eating broccoli, they may have to eat 3 ½ cups of broccoli. Another option is to eat Brussels sprouts, which may only require we eat a cup, in order to get the gut health benefits. But eating broccoli may do additional wonders for your health, and I’ve discovered some creative ways to incorporate it into meals that are delicious. Make a broccoli pesto sauce or add broccoli to your veggie pizza. I also found that I actually like broccoli in an omelette or scramble with other veggies. You can also chop up broccoli and put it in a turkey, veggie or chicken wrap. I even discovered a green smoothie with broccoli and pineapple. You won’t even taste the broccoli! Broccoli sprouts on a sandwich are good for a refreshing, crunchy texture. And of course, if you actually like the taste of broccoli simply saute it with a little bit of garlic, pepper and salt for a simple side dish. Now let’s take a closer look at what eating broccoli may do for your health. Broccoli may help prevent cancer. Broccoli and other cruciferous veggies may help prevent different types of cancer. Cruciferous veggies contain a compound called sulforaphane. Some studies even show that broccoli may lower lung cancer risk in smokers! Broccoli consumption is also reported to mediate a variety of functions including providing antioxidants, regulating enzymes and controlling apoptosis and cell cycle. Broccoli may help with bone health. Broccoli is very rich in calcium (43 mg in one cup) and vitamin K (92.5 mcg in one cup), which both help build and maintain strong, healthy bones. If you do not eat dairy, broccoli is a great non-dairy source of calcium and other essential nutrients. Broccoli may help protect your heart. Broccoli is rich in soluble fiber, which attaches to cholesterol particles in the body and draws them out. This may help lower cholesterol levels and help prevent heart disease. 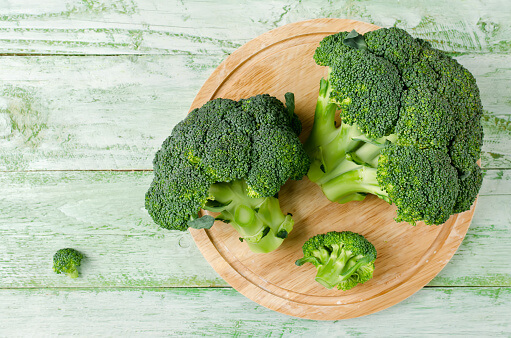 Broccoli is also a veggie that does not cause blood sugar spikes, making it a good food choice for people with diabetes. The fiber in broccoli may help you feel fuller for a longer period of time and maintain a healthy weight. Fiber also helps with constipation and other digestive issues, like irritable bowel syndrome (IBS). Magnesium, 19 mg. This must-have mineral helps with blood pressure regulation and also has antioxidant properties. Several studies have also shown an improvement in the severity of symptoms of depression when study participants were given 125-300 mg of magnesium with each meal and at bedtime. Phosphorus, 60 mg. This mineral works with calcium to build strong bones and teeth. It is also needed to help balance and use other vitamins and minerals, including vitamin D, iodine, magnesium and zinc. Potassium, 288 mg. There’s a surprising connection with the liver and potassium. Liver injury or infection causes patients to urinate their potassium out. When the liver heals, the potassium levels start to go back up. This has implications for people with chronic liver problems, in terms of both diet as well as use of medications, since very low potassium levels can be more dangerous than the liver problem alone. Potassium may also help keep blood pressure under control and may even help reduce kidney stones and bone loss as you age. Sodium, 30 mg. This often feared mineral is something we may have been told to avoid, but in reality sodium helps to engineer the actions of every human cell. Every human action including eating, thinking, running and working depends on adequate balance of sodium. Just be careful and talk to your doctor about your particular sodium needs. Avoid processed foods, which usually contain way more sodium than any of us may need. Broccoli provides a healthier, more natural way to get sodium. Vitamin C, 81.2 mg. You likely know about the immune-boosting benefits of vitamin C, but what about this nutrient’s importance regarding aging? Click here to find out. Folate, 57 mcg. Folate (also called vitamin B9) is a very important nutrient, especially for pregnant women. Folate may also help prevent cancer and heart disease and improve mental health. A study from Harvard Health demonstrated folate may also be useful in treating symptoms of depression. Vitamin A, 567 IU. This vitamin is an antioxidant that supports the immune system and is good for skin and eye health. Vitamin A also promotes cell growth. If you’re like me and can remember pushing broccoli off your plate as a child, I encourage you to try it as an adult. If you have kids, get creative with them in the kitchen and get them on the broccoli bandwagon.